Punch-Croisières is a yacht charter company based on the Marina of Le Marin in Martinique. For more than 22 years today, we offer to our clients our experience of the West Indies directly from our unique base in Martinique. Punch-Croisières is also a familly size structure where each client is treated individually and according to their need throughout the preparation and conduct of their Caribbean cruise both in Martinique and in the neighboring islands. The focus will be put on you from your cruise preparation up to your arrival at our base. Our values as passionates of sea and sailing is to give our customer what we would expect to have while renting a yacht somewhere else. The Marina is only located at 35 minutes of distance from the airport of Le Lamentin. It is actually the main center of the Caribbean Sailing and starting point for vacation to the Grenadines. All services are available on site, from sailboat rentals to banking etc... Our base and office are located by the sea below the little town of Le Marin. 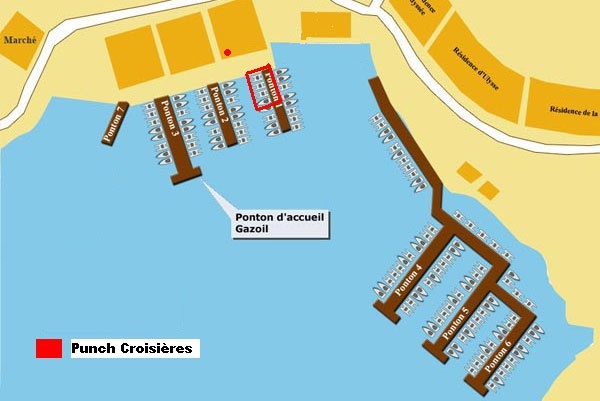 You will then find us in front of the pontoon 1 where your boat will be waiting for you for your first night onboard. The base manager (Eric) and all the team (Paul, Sarah, Pierette, Raymond, David and Michel) will welcome you.